The following little story about the Gift of Hospitality struck a chord with me. Like Emilie Barnes, our life was not an easy one, growing up in the big city of Regina, Saskatchewan, Canada. Oftentimes we didn’t know how the food was going to be put on the table. My mom went through a lot in those years, trying to work as a nurse’s aid, manage a household of an unusually large amount of children for those parts and that time (there were 6 of us kids). Yet through it all, my mom had an openness and kindness to other people that was an example to all of us. She never turned down anyone when it came to raiding the refrigerator or making them feel welcome. If someone walked in at mealtime they were invited to sit with us even though the fare may not have been ample. It was an inspiration to me! This little anecdote reiterates the value of an Open Heart, Open Home mentality and what an example we can be in this realm for our children. How often I heard her say those words when I was growing up. And how little I realized the mark they would make on me. Those were hard years after my father died, when Mama and I shared three rooms behind her little dress shop. Mama waited on the customers, did alterations, and worked on the books until late at night. I kept house – planning and shopping for meals, cooking, cleaning, doing laundry – while going to school and learning the dress business as well. Sometimes I felt like Cinderella – work, work, work. And the little girl in me longed for a Prince Charming to carry me away to his castle. There I would preside over a grand and immaculate household, waited on hand and foot by attentive servants. I would wear gorgeous dresses and entertain kings and queens who marveled at my beauty and my wisdom as they lavished me with gifts. But in the meantime, of course, I had work to do. And although I didn’t know it, I was already receiving a gift more precious than any dream castle could be. For unlike Cinderella, I lived with a loving mother who understood the true meaning of sharing and of joy – a mother who brightened people’s lives with her gift of hospitality. She would usher our guests back to our main room, which served as a living room by day and a bedroom by night. Quickly a fresh cloth was slipped on the table, a candle lit, fresh flowers set out if possible, and the teapot heated. If we had them, she would pull out cookies or a loaf of banana bread. There was never anything fancy, but the gift of her caring warmed many a heart on a cold night. And Mama didn’t limit her hospitality to just our guests. On rainy days I often came home from school to a hot baked potato, fresh from the oven. Even with her heavy workload, Mama would take the time to make this little Cinderella feel like a queen. My mother’s willingness to open her life to others – to share her home, her food, and her love – was truly a royal gift. She passed it along to me, and I have the privilege of passing it on to others. What a joy to be part of the warmth and beauty of hospitality! 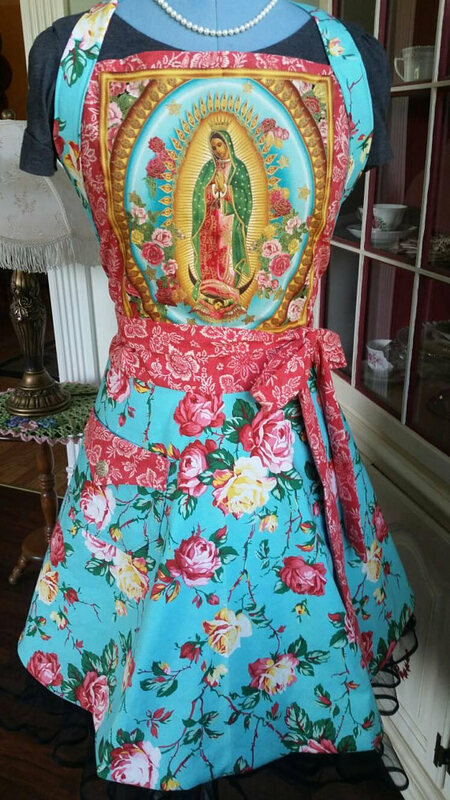 Sacred and Immaculate Hearts Apron! Feminine and Beautiful! This post contains affiliate links. Thank you kindly for your support. I have a friend who practices hospitality in the most beautiful way. This post reminded me of her.